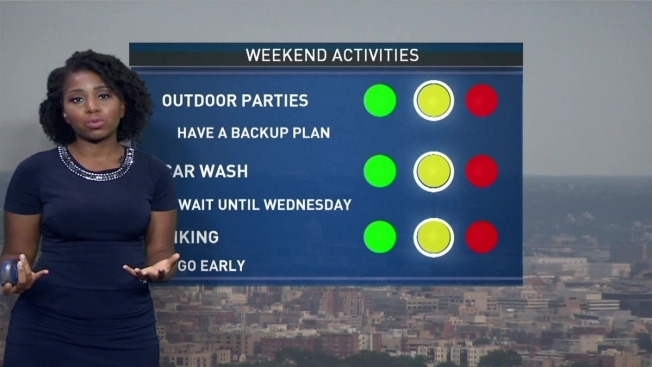 Storm Team4's Somara Theodore breaks down what to expect for the rest of the weekend. Some scattered showers are possible again Sunday as hot and humid weather continues. Temperatures climbed to the upper 80s Saturday afternoon and the humidity made it feel like the low 90s in D.C. Earlier Saturday, D.C. activated its heat emergency plan after the National Weather Service said the heat index exceeded 95 degrees. Cooling centers were open around the city; here's where to find one near you. Storm Team4's Somara Theodore said there's a chance for some light showers overnight. Sunday brings more isolated showers and the chance of another storm, but slightly cooler temperatures in the low- to mid-80s. Storm Team4 Chief Meteorologist Doug Kammerer said severe thunderstorms that hit the D.C. area Friday evening brought down more than 30 trees in the region. Temperatures soared into the low 90s Friday afternoon and at about 4:30 p.m. the feels-like temperature was 102 for D.C. Most of the area will dry out by Monday before another chance for rain arrives Tuesday.